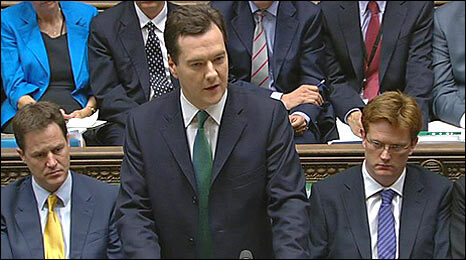 VAT will rise to 20% and benefits are being cut as Chancellor George Osborne unveils his "tough but fair" Budget. George Osborne says the Budget package of cuts and tax rises means Britain can "look to a brighter future". Labour leader Harriet Harman says the Budget is "reckless", "unfair" and will lead to thousands of people losing their jobs. Budget: What difference has the coalition made? How will the increase to 20% affect you? BBC pension changes: A course others will follow? How would you cut the government's Budget?